RSVP and receive address info. Please contact me to RSVP at befreemoments@gmail.com or call me at 720-202-2793. 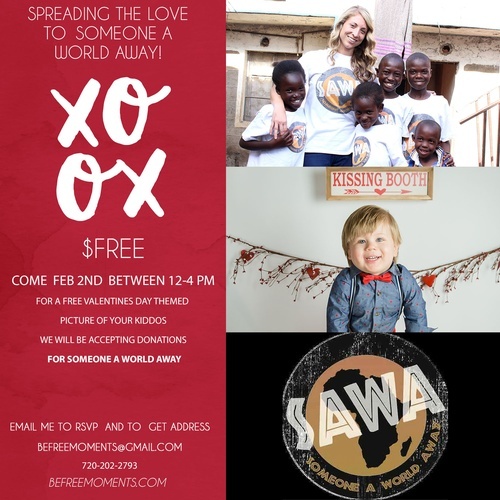 Befree Moments Photography in Lafayette is hosting a Valentine's day photo party of your kiddos, for charity. We will be accepting donations, no minimum amount required. Even a $1 makes a difference. Show up between 12-4pm and get a photo taken of your kiddo for Valentine's day. All proceeds go to "Someone A World Away". Please contact me to RSVP at befreemoments@gmail.com or call me at 720-202-2793. www.befreemoments.com and www.someoneaworldaway.org"